You love your pet. When your pet is sick, you want to find the best care possible. Dr. McCarthy, Dr. Cheever, Dr. Hellreich, Dr. Coulter, and the entire veterinary medical team at The Village Animal Clinic provide the best possible care for your pet in a compassionate and loving environment. 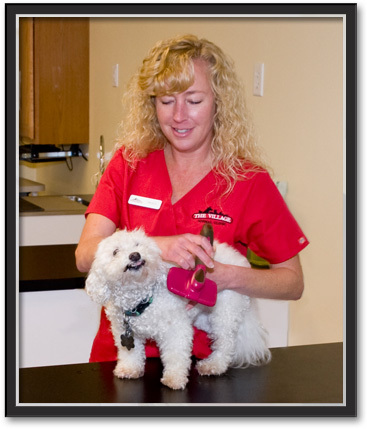 Our staff is committed to providing medical excellence for your pet and open communication with you, our client. The Village Animal Clinic is a full-service animal hospital and wellness center staffed by compassionate and caring individuals. From the latest ultrasound technology to advanced surgical procedures, your pet receives the highest level of care available. To provide you with the high-quality veterinary care that you expect and your pet deserves, we offer a broad range of medical services. Our focus is on disease prevention and wellness care. Through our preventive care program, your pet receives a comprehensive "nose-to-tail" physical examination in order to establish his or her own overall health profile. Your pet receives personalized, high quality care based on his/her needs and lifestyle. Whether your pet is a playful puppy, an elderly cat, or a frisky ferret, he or she receives the best care possible at The Village Animal Clinic. We offer a full range of treatments from traditional spays and neuters to more advanced diagnostic, medical, and surgical procedures. Our highly qualified and skilled veterinary staff performs advanced diagnostic tests for your pet. Test results are usually available immediately, allowing us to treat your sick or injured pet as quickly as possible. Sometimes one of the frustrations of dealing with a sick pet is that you cannot simply ask him/her what is wrong. 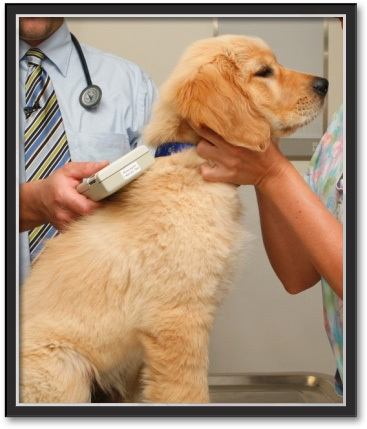 Therefore, The Village Animal Clinic has invested in the latest advanced diagnostic technology. When your pet is not well, we need to find out what is wrong. After performing a thorough examination, a series of diagnostic tests is often necessary in order to identify the medical condition. All the veterinarians at The Village Animal Clinic are knowledgeable and have a large amount of expertise in diagnosing and treating complex internal medicine cases such as kidney, heart, respiratory, immune-mediated, and endocrine diseases. This is why the team at The Village Animal Clinic views microchip lost pet IDs as a standard of protection for your pet. With a microchip, your pet can be identified quickly and easily by animal control officers, shelters or at veterinary hospitals. Microchips are safe, unalterable, and permanent identification for pets. The entire implant procedure takes less than 10 seconds. We use the AVID microchip system. Unlike other companies, AVID offers a one-time registration fee for the life of your pet and uses microchips to register the animal with a unique identification number that is filed in a database with important contact information. This information can be updated at any time. AVID membership also offers benefits such as proactive pet recovery and free access to ASPCA Poison Control. AVID also comes with a number of very useful services to pet owners such as their National Pet Recovery Database, Lost Pet Specialists, Rapid Lost Pet Alerts, Lost Pet Medical Insurance, Travel Assistance for Found Pets, and more. AVID uses technology that is standardized around the world so that your pet's microchip can be read at shelters in a number of countries. Glaucoma is a condition in which the fluid pressure inside the eye increases to a point where the optic nerve is damaged, causing loss of vision and blindness. Glaucoma doesn't only affect humans; your pet can develop this condition, too. In fact, glaucoma is relatively common in animals and can develop as your pet ages; this is known as chronic glaucoma. Glaucoma can also occur as the result of an injury or illness; this is known as acute glaucoma. In many cases, glaucoma can progress quite rapidly - especially when it is the result of injury or underlying illness. It is an emergency situation. The Village Animal Clinic's veterinarians are skilled at identifying the early signs of this dangerous eye condition. Due to the severity and incidence of glaucoma, we recommend that your pet be checked regularly for this disease. A routine glaucoma exam is not only an effective screening measure for chronic and acute glaucoma, but can also help set a baseline measurement. Setting a baseline measurement is important because normal intraocular pressure (IOP) can vary between species, breeds, and even individual pets. At The Village Animal Clinic, we use an instrument called a tonometer to measure the fluid pressure inside your pet's eyes. This is a noninvasive, simple procedure that should not cause your pet any pain or discomfort. Your veterinarian will apply a mild anesthetic eye-drop to ensure your pet is comfortable during the exam. These problems can indicate a serious dermatological or allergic reaction to allergens such as fleas, pollen, dust, and various foods. If you notice any of these symptoms, it is important that you bring your pet in to The Village Animal Clinic for an evaluation. If left untreated, these problems can become severe medical concerns. At The Village Animal Clinic, we take the time to explain your pet's condition, how to prevent future occurrences and the proper method of treatment. 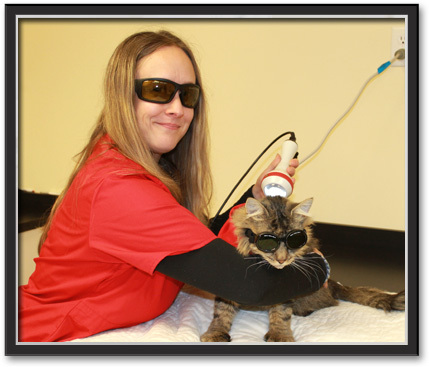 To further reduce pain and promote healing after surgery, an injury, or to manage a range of chronic and acute conditions, The Village Animal Clinic offers laser therapy. Laser therapy is a painless FDA approved medical procedure that uses low-level lasers to stimulate the natural healing capabilities of the body's cells. This form of laser therapy is effective at promoting healing on a cellular level as well as decreasing inflammation after surgery, injury, or in areas of the body affected by chronic illnesses such as arthritis or acute conditions such as otitis. It can also be used to increase joint mobility and relieve the aches and pains common to geriatric pets. Laser therapy creates a deep penetrating light that induces the body to release endorphins and stimulates the injured cells to heal at a faster rate. During each painless treatment, the laser's energy increases circulation, drawing water, oxygen, and nutrients to the damaged area. This tool enables us to offer our clients an alternative to pharmaceuticals that is capable of producing immediate results without any dangerous side effects. Your pet does not need to be sedated for laser therapy treatments and the experience is usually pleasant and comforting. Improvement is often seen after the first treatment; however, the length and frequency of treatments varies with your pet's condition and most pets require several treatments to achieve maximum benefits. Generally, 4 - 8 treatments produce the best results and laser therapy treatment effects are cumulative. 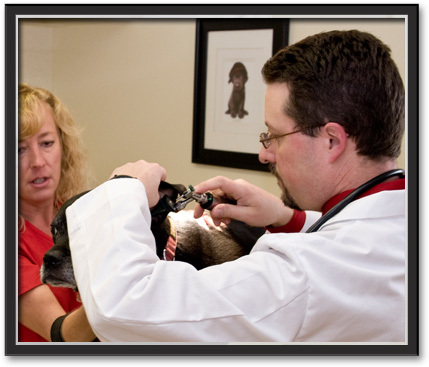 Your veterinarian at The Village Animal Clinic will recommend a laser treatment plan specific to your pet's condition.